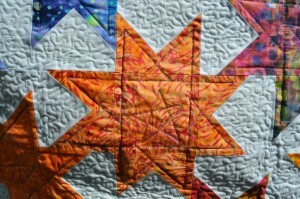 I’d taken a great fancy to the Sparkle Punch quilt on the Oh Fransson blog, and thought it would look very well with a vibrant selection of batiks. 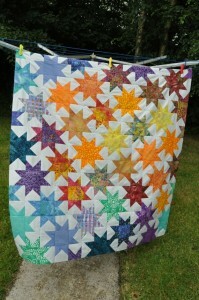 I bought a few more fabrics to round out my colour palette, and decided on the size of my squares to make up the stars. I ended up using squares cut to 4″ because that size would give me the necessary five squares from one 4″ strip cut from a FQ, or ten squares from a 4″ wide WoF strip. The background was a very neutral blue-grey cotton that I hoped would set off the bright colours. I made up enough squares to make two stars of each fabric, then spent a couple of hours crawling around on the sitting room floor arranging them into something attractive! 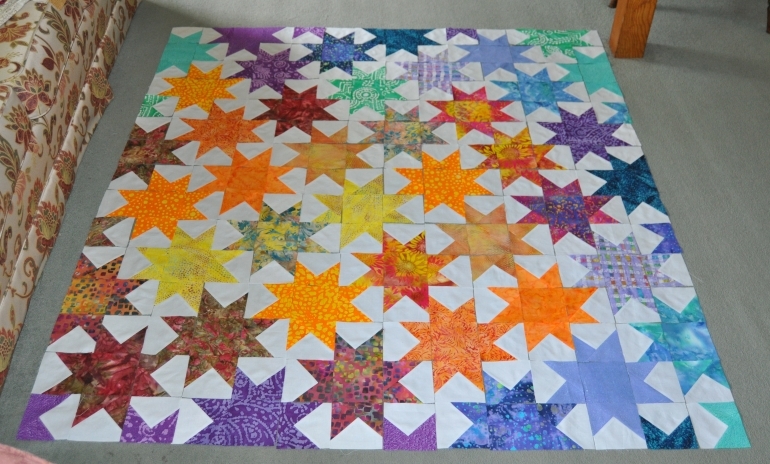 Because I wasn’t sure what my layout would be like, I made up whole stars with the knowledge that I wouldn’t use all the squares in the finished quilt; “spare” star points were used to fill in gaps along the edges. I ended up with a quilt that was ~48″ in one direction and ~52″ in the other. 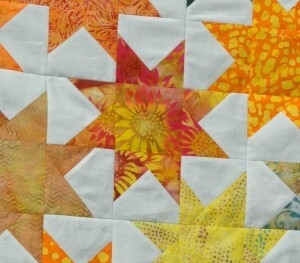 The squares pieced up really nicely, which I was pleased about – accurate corners make me happy! 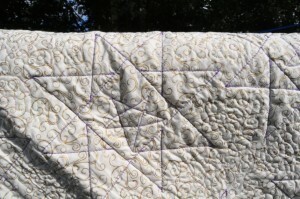 It took a few goes to find suitable backing fabric for this quilt. At first, I was planning to use batik fabric, and had a marvellous time looking at a myriad of batiks at the Festival of Quilts. However, it was hard to choose something without the finished quilt top or any fabric samples with me. I did buy a length of dark blue/purple batik with nova-like yellow splashes, but in the event it didn’t really work with the quilt top. 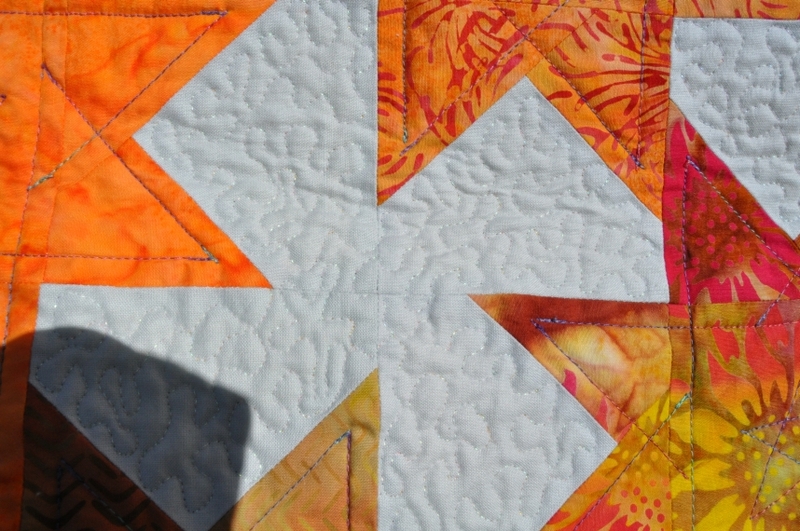 Mum veto’ed my plan to back the quilt with a sort of mini “jelly-roll race” strip that I’d made up with batiks left over from the stars (I could see her point), and we auditioned various sheets from the airing cupboard as well. In the end, I remembered that I’d bought more gold swirly fabric to use on Sian and Neil’s wedding quilt, and what could be a more apt backing? Especially as it’s extra wide! 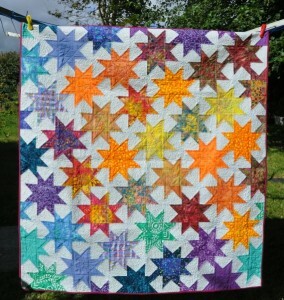 The stars were echo-quilted on the inside by using a walking foot, a slightly fiddly prospect on a domestic machine! I used a purplish rainbow-y variegated thread; in retrospect it’s a little strong in places (like the lighter stars), but it was what I had available. The bobbin thread was a coordinating pure purple thread. The negative space between the stars needed “flattening”, so I stipple-quilted them with some white iridescent thread I had left over from another project, with a variegated gold metallic thread on the back. Unfortunately, I’d vastly underestimated just how much thread all that stippling would eat, and to my horror I ran out of my white metallic thread half-way through the quilt and half-way through the Sunday before the Show! 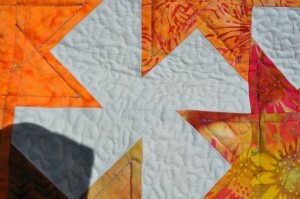 There wasn’t anything I could do then, so I concentrated on the other quilt I was making. Frantic ringing around everywhere and anywhere on Monday morning turned up the thread in a shop in Aberystwyth, so my heavily pregnant sister was sent on a mission to buy me some more (she didn’t know at the time that the quilt was for her baby). Mum, bless her, went to collect it, as well as making a mercy mission to the local fabric shop to get the few bits of fabric I still needed to bind this quilt and back and bind the Birds and Bees quilt I was making simultaneously. I did manage to finish this quilt (and the other) in time for the Pembrokeshire County Show, although the binding was only finished at about 3am on the first day of the show and my finger tips were raw and bleeding by that point! Neither quilt won anything, but I am still extremely pleased with how they came out and hope they’ll bring their recipients much pleasure.